Vaal University of Technology is a tertiary institution in South Africa. It attracts students from all over the country. It is one of the largest residential Universities of Technology, with about 15,000 students, 300 programs, all primarily taught in English. The campus and facilities are conducive to learning, research, recreation and sport, art and culture, and community service. On the 23rd of July, Geekulcha took part at the VUT Open Day 2016 to reach out to youngsters who are looking to further their education. The invite was made through the Google Developer Groups at VUT. 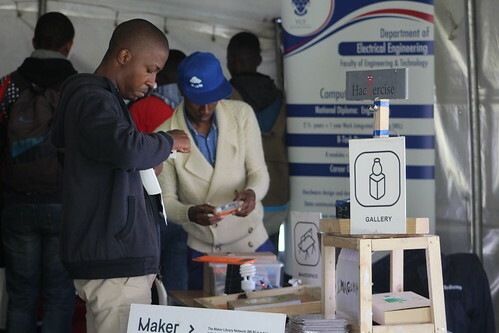 The Geekulcha Maker Library Network had setup some of the projects developed by young makers at the exhibition area to help present ICT as a career path to follow. High schoolers were told about the Geekulcha Vacation Work (gkVacWork) programme. Some have already started applying for the programme. It was evident that girls are really scared of the Science and Technology fields as career paths. A lot still needs to be done to bring more interest. A great day it was, lot of exhibitions, the future of South African Tech and Innovation looks very bright, we just need need to equip and groom the future generation with adequate skills and momentum.